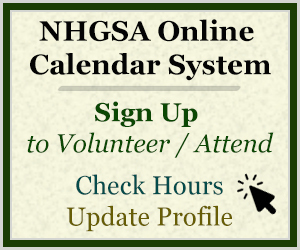 Do your holiday shopping and plan your year of fun while supporting NH Granite State Ambassadors by bidding at their online holiday auction October 26-November 5, 2018 at www.32auctions.com/NHGSA2018. There are over $10,000 in items to bid on including a ton of overnight get-a-ways, dining certificates, attraction tickets, ski tickets, signed books by NH authors, festival tickets, gifts, memberships and loads more. Plan your New Hampshire Stay-cation and support a great organization! Great Customer Service and Word-of-Mouth marketing is king and we do it best, but not without a lot of hard work behind the scenes! Each year our passionate volunteers participate in multiple, targeted tours and trainings to stay up on all New Hampshire has to offer so they can give the best and most knowledgeable referrals. Our GSA certified volunteers serve approximately 20,000 hours annually and engage with over 1 million guests in-state and out-of-state at over 40 Welcome Centers and Events leaving a warm, friendly impression of New Hampshire, which keeps our guests coming back time and time again. With tourism being New Hampshire’s second largest industry, repeated and extended visits are vital to our economy. Please join us so we can ensure our volunteers have all the resources, and learning opportunities they need to do the best job they can for your community. New Hampshire Granite State Ambassadors add value to state agencies, local businesses, and individuals through a training and service support network that sustains and enhances the New Hampshire experience. As a 501(c)(3) non-profit, charitable organization, NHGSA serves hundreds of travel- and tourism-related businesses including key partners, Manchester-Boston Regional Airport and the NH Division of Travel and Tourism Development. Our award-winning organization has certified over 1,740 residents and employees who staff front-line visitor centers that support the authentic culture of New Hampshire, its people, and its products. Since 1996, GSAs have given over 320,000 hours of volunteer service providing personal assistance to millions of guests visiting the Granite State. Our GSAs actively serve New Hampshire city, state, federal, and private organizations, such as regional associations, chambers of commerce, and major events. Find out more about NHGSA, Inc. at www.nhgsa.com.